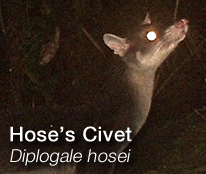 Funding for conservation and ecological research is scarce, especially so for species not on the “radar” of corporate sponsorship such as the Hose’s Civet. Such funding is, however, urgent and desperately needed. Research and conservation will not get far without committed, self-motivated individuals. If you are passionate about nature and wildlife and would like to volunteer with HOSCAP Borneo, please email John, including your background, amount of time you can spare and short CV. Volunteers should ideally be able to commit themselves for several months at a stretch, though it may be occasionally possible to fit in individuals over a shorter-term or work from a desktop at home. We are looking for persons who enjoy physically intensive fieldwork or those with technical skills (e.g. labwork, statistics, media editing, database and website development). Thank You. It would not be possible to conserve and protect our wild lands and wild life without your support and generosity.